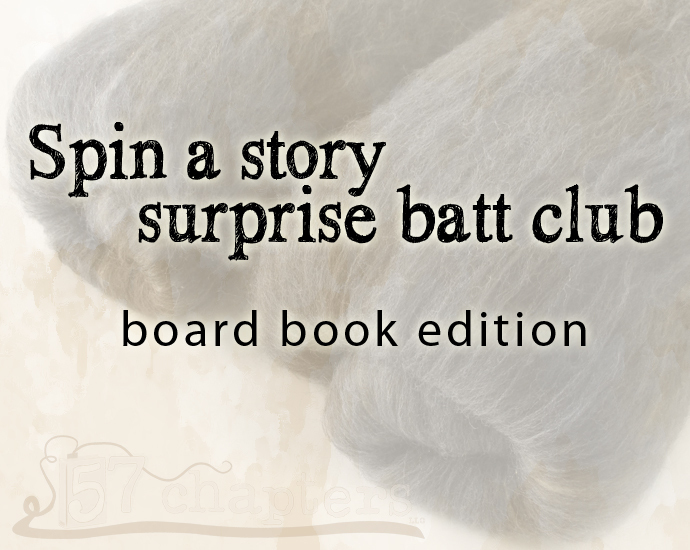 Get a package full of beginner friendly batts ready to spin! These batts will be limited to 2 or 3 ingredients, longer staple wools, so not quite as soft as the normal SaS batts - but great if you are new to spinning or new to spinning from batts - or if you just prefer sturdier wools for hard wearing items. These are the batts for you! Order from the 1st to the 14th of the month to receive the club shipped at the END of that month. Orders from the 15th to the end of the month will ship in the FOLLOWING month's club! Each month's club inspiration will be posted on the facebook page and ravelry group! Club will include EIGHT ounces of fiber plus some kind of surprise. Extras may sometimes include patterns delivered thru ravelry, so please include your ravelry name with the order. Or message me after ordering if you forget. This is a double dose of fiber, one serving of "extra" of the month. This listing is for Board Book batts edition of the club. Please see shop policies for allergy information. Welcome to the shop! I'm a graphic designer turned fiber fiend. I love playing with color, whether in Photoshop or the dye pots! Have a look around - just let me know if you have any questions!